This year marks the 15th anniversary of this wonderful little festival in St. Mary’s County, MD that has been growing in popularity over the years. Before I get into the music, I want to share a little about what makes this festival so special and unique. First of all, when you combine the terms jazz and seafood in the same sentence, you’ve already got my attention. Secondly, this festival focuses on quality, not quantity. I’ve been to outdoor festivals that have too many artists on the line-up. They try to cram as many artists as possible into a day. There is such a thing as too many, and less can sometimes really be more. I understand the need to get more bang for your buck, but sometimes it’s too much, and the quality of the music suffers. Too many artists on one bill usually means they will play an abbreviated set, and there will be long gaps between acts as the crew tries to break down the previous bands set-up, get the next band ready to go, do a plug and play, and hope for the best. I would rather have less artists playing with longer sets. I think it gives the artists a chance to dig a little deeper into their catalogs rather than stick to just their popular hits. The quality versus quantity theory is extended to the audience as well. This festival only sells 800 tickets, which results in a fairly intimate environment. Again, I’ve been to outdoor festivals that have been grossly oversold to the point that you cannot move for all the people, blankets, lawn chairs, coolers, other furniture, etc. that folks bring with them to these events. You’re either trapped in your seat, or you’re forced to walk on people’s blankets or step over or move their chairs, all of which can turn your jazz festival experience into something uncomfortable or unpleasant. This festival generally books three acts which begin playing at 3pm. The gates open at 12pm, so you arrive early, making sure you sign up for the door prizes that will be raffled off later, secure a good spot, check out the museum, take a boat ride over to St. Clements Island where you can step back in time and visit the old lighthouse and keeper’s home, which is open to tourists as a museum, and you can explore the grounds. When you return from the boat ride, you get yourself something to eat and drink, catch up with old friends, make new friends with the people sitting around you, and just chill until the music begins at 3pm. This year, Oli Silk and his band opened the festival. I was excited because this would make my first time seeing him perform. I knew of him, and off his work as a musician and a producer, but I was anxious to hear him play. He is very talented and personable and quickly made a connection with the audience. We learned that he was influenced early on by artists like Ramsey Lewis and Tina Marie, so that tells you a little bit about the type of artist he is. I enjoyed his performance and look forward to catching him when he comes around again. Elan Trotman was the second act of the day. His current release is a great CD called Tropicality, which explores his Bajan heritage, as well as the greater Caribbean influence. He even had a steel drum player as part of his band, which was great. I was so happy to hear “Tradewinds,” my favorite song from that album. Elan pulled songs from his past and present catalog, as well as covering some songs from fellow Bajan, Rihanna. It was a good set. 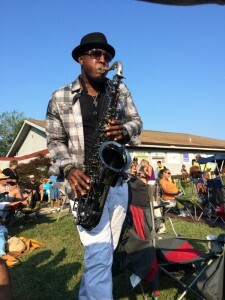 He kept the crowd moving with a good selection of old, new, jazz, and R&B, including songs by legendary smooth jazz favorite, Grover Washington, Jr. 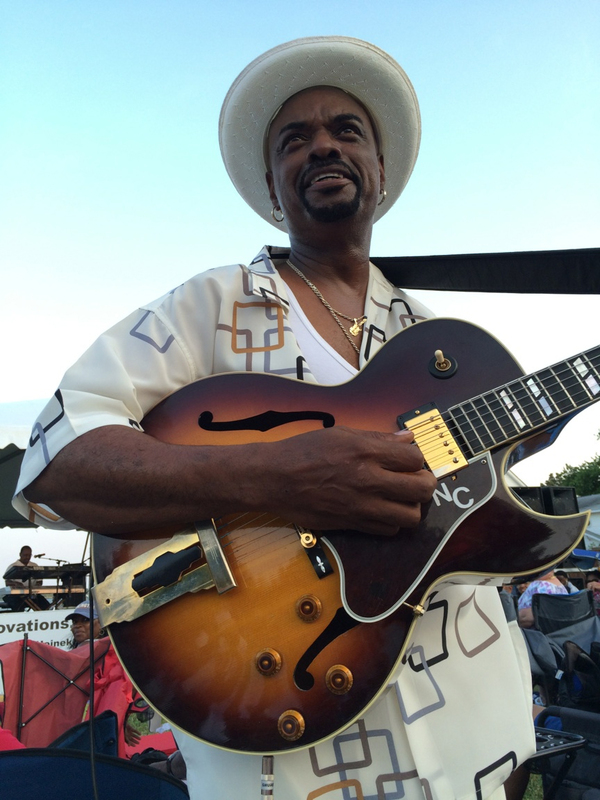 The festival closer was none other than the incomparable Nick Colionne. Who better to bring it home than the best dressed man in the business? Nick’s got a fantastic new album, Influences, which released just a few short months ago in April. If you’ve ever seen Nick perform, you know it’s going to be a party. The live versions of the new music were fantastic, as were the Colionne classics we’ve come to know and love. One of the things I like about Nick’s show is that it has a very down home, real, and organic feel. He and the band are so together that the performance looks natural, not staged; the banter flows easily, their moves are natural, as are their reactions. You clearly know that Nick is feeding off of his band and the audience. It’s very inclusive and interactive with the audience. You don’t feel as if you’re watching a production. I’ve been to shows where the entire concert feels staged and the banter seems scripted. While the music is good, the performance feels more like theater than a concert. You feel the separation between artist and audience. Not so with Nick C.
By the end of the show, when Nick has left the stage to work the crowd, no one is sitting down. The band is on fire, and Nick’s Road Manager/Guitar Tech, Chris Jones, steps in and begins to play. Good thing we were outdoors. Had this been a venue with a roof, it would have blown it off. The festival came to a close with a bang. We had a great time, enjoyed a beautiful day by the river, ate some good food, and listened to some incredible music. We would be amiss if we didn’t give a shout out to Kim Cullins, who is at the helm, and organizes this festival every year. Kim’s passion, spirit and infectious personality help make this festival what it is, and we thank her for doing this every year. Music lovers – mark your calendars for the 2015 Potomac Jazz & Seafood Festival. It will be held on July 11th. Smoothviews will see you there!